Harrogate Railway’s poor run of form continued on Tuesday evening when they were beaten 4-1 on home soil by Thackley. Ray Green’s side’s latest defeat means the Locomotives have not tasted victory in the NCEL Premier Division in two months since former boss Paul Beesley led them to a 2-1 home win over Armthorpe Welfare on January 21. Despite once again lining up with an extremely inexperienced side, the men from Station View kept their fifth-placed opponents at bay until two minutes before half-time when Mike Garrod fired home a left-footed effort. Garrod struck again just three minutes after the resumption before completing his hat-trick in the 65th minute and handing Thackley complete control. 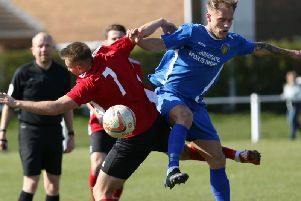 Daniel Broadbent then registered two minutes later to put the result beyond any doubt, and although Railway skipper Steve Bromley pulled a goal back almost immediately, the damage had already been done. The Locomotives remain 17th in the league standings despite the loss.